After reviewing some of the tens of thousands of photos I have taken in Italy, a few interesting ones make me laugh and say, “Only in Italy.” Two things prompted me to take each photo. One is that I hadn’t seen anything quite like it before. And two is that the subject is so quintessentially Italian, I had to photograph it. Some are unusual and some are just cute. 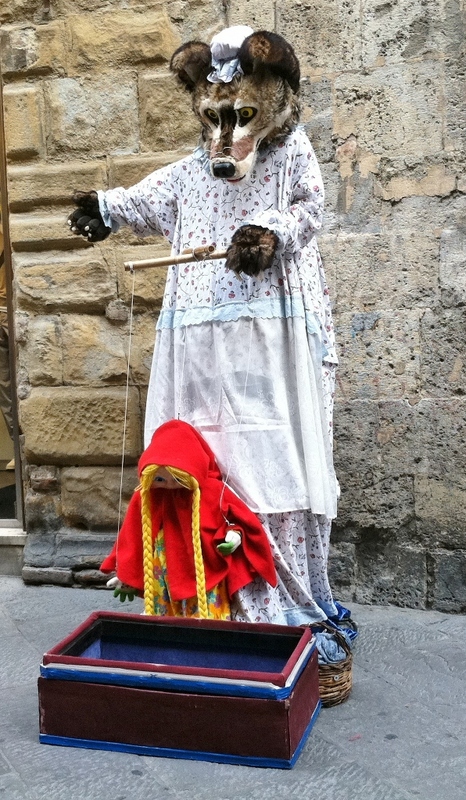 I came across this scene on the streets of Siena on Easter Sunday. A crowd was around watching until the wolf stopped moving and stood still like a statue. 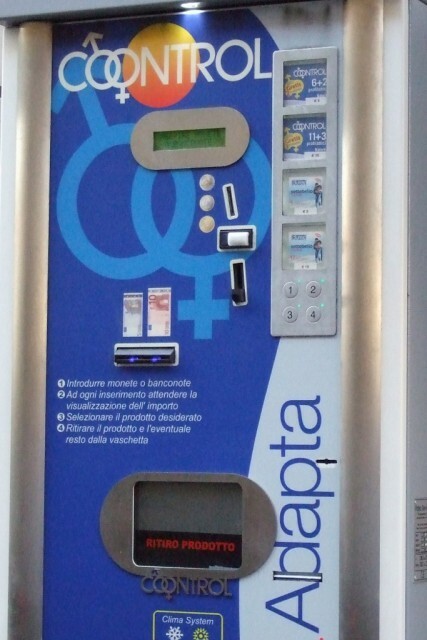 When I saw one of these condom vending machines on the streets of Rome.I was shocked the first time. For a country that is 98% Catholic this is more than interesting. Really, though, every city has these on the streets. I love these tiny trucks. They are called “Apes.” I thought they only existed in Italy, but now I’ve learned they are in many other countries as well. You’d be out of luck as a driver if you were tall or overweight though! I don’t think I’ve ever seen a chandelier delivered like this. The narrow streets of Ravello make this the only way to accomplish this task. Keeping the city of Milan safe. These military police mean business, and they don’t allow you to take their photos. I captured this one from behind. 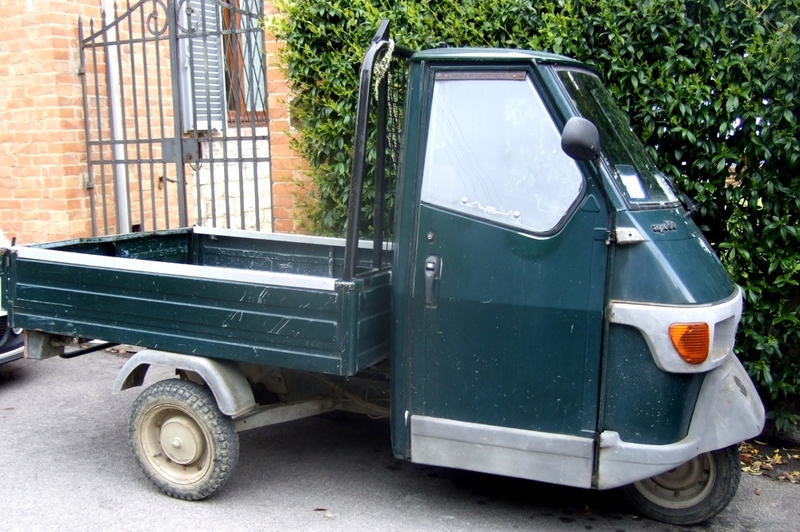 So many situations meet the criteria for “Only in Italy,” These are just a few photos I thought you’d enjoy. I’m interested in any feedback, so please leave a comment. My fourth book about Italy is available now. You can check out all of them here. Italy is a catholic country but it now picks and chooses what it want to follow. It has the lowest birthrate in western Europe, so it would appear that birth control is being practiced far and wide. Very few people actually attend church these days and most priests and nuns have to be imported . I think it is great that these condom vending machines are around. We have them in Australia too. I live in the most liberal, immoral country in the world and have never seen a condom machine outside of a males only bathroom in a bar. (Clean up your mind, I was scrubbing toilets in my mother’s bar). Since the schools and health department pass out free condoms and birth control pills as well, I doubt any machines on the streets would garner much of an income. You really give us a lot to think about in these posts, thank you very much. We “stay at homes” enjoy our travels thru the eyes of our friends. Bonnie D. back again, I love the laundry, brings it down to homebodies. Our tourist areas (Florida, USA) are devoid of human sign after 5 pm and before the bar scene begins. I like knowing that locals are taking care of their households and living their lives in Italy. I’ve seen those machines in many Ladies Rooms, too. I remember one of the things that struck me at first, especially in Rome, was the number of clergy you’d see doing normal things. But I’ve gotten used to seeing nuns on cell phones and stores that sell garments for priests. Washing lines always make good pictures. Congratulations on the book!